I’m not a wake-up-to-watch-the-dawn kinda guy. I like sunsets better. Sipping pina coladas on the beach while a big, red sun sinks into the waves is more or less the perfect end to any given day. Dawn seems too cold to me, like a Parisian fashion model stalking down a runway. Partly, this is because it often is cold in, you know, the morning. Still, sometimes I find myself in a position to watch the dawn, and when that happens, I try not to miss it. This morning, for instance. 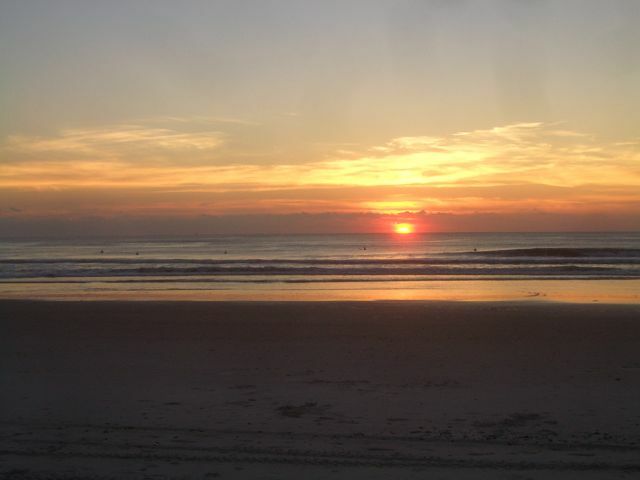 I was on a beach in Jacksonville, Florida, well before daybreak. As I sat there on the steps of one of the many wooden staircases built to give access to the beach, I watched the lights of buoys, markers, and fishing boats out in the darkness. They flickered like firefly mating calls. South was the glow of the city, distant at the faraway curve of the beach. Above me was a bright, horned moon; to the northeast was the Big Dipper. The waves of the Atlantic roared, even though I could only see hints of their shapes lit by the white glow of moonlight. After a while, a line of lightness appeared in the east, a deep blueing of the nighttime black. A cloud bank on the horizon took a shadowy sort of form. The waves continued thrumming. A chill breeze continued pushing at my back. The blueing crept higher in the sky, replaced in the lower firmament by a ruddy blush the color of that Parisian fashion model’s eye shadow. The Big Dipper began to fade from view, although directly above me the waning moon was still bright, surrounded by a corona of stars. The clouds to the east became more distinct, some fading into the background of distance, others showing themselves as long, black lines against framing redness. Tiny birds zoomed across the sand at the edge of the tide, many of them darting fleet-footed on the ground, but some of them flying so low that it seemed as if they were running on their wingtips. The blueing expanded, reaching out toward the sides, arcing around me, even while the ruddiness began to contract, to focus upon the spot on the horizon that the sun was steadily approaching. Surfers appeared from over the grassy, still shadowed dunes behind me. Their long boards were tucked under their arms; sleep and anticipation fought for supremacy on their faces. The birds began to call out as if they were welcoming the surfers. The firefly lights out on the Atlantic resolved themselves into the forms of ships, some much closer than I would have guessed an hour earlier in the pre-dawn black. The Big Dipper had vanished completely. The moon had lost its circlet of stars. A yellow band appeared between the blue and the blush, signaling that even though the sun wasn’t yet visible in the sky, dawn had all but turned into day. There was one last flaring of neon across the clouds low on the horizon, and a brightening to near-incandescence of the clouds closer and higher. Everything in the sky became crisp and clear. It was a sky that cried out to be savored with coffee. But I’ve never been a coffee drinker. Then, as the surfers caught their first big waves — waves they sometimes rode the length of and which sometimes turned on them, burying them momentarily beneath thick sheets of cold water — the ruddy red blush contracted even more, and then more, until it became a hemisphere rising up in the distance. The sun had awoken one more time. I watched it as it bellied up out of the eastern Atlantic, becoming full and red, then full and yellow, and finally shrinking to a white brightness that was painful to look at, forcing me to turn my gaze to the joggers and seashell hunters that had mysteriously and magically appeared on the beach while I had been busy watching the dawn. After a moment, I joined the wanderers, seeing if I could find any interesting shells or other flotsam left behind by the receding tide. It had been a beautiful dawn. Still, give me sunset and that pina colada. At least you don’t need a coat. So excuse me a moment while I wander down the beach a ways, find a place to read, and wait for the sun to work its way to the other side of the world. Dawn as seen from the beach in Jacksonville, Fl. No sunrises were harmed in the writing of this essay. If you’d like to tell the author about your favorite coffee blends, feel free to use the comments section, below. This entry was posted in Observation Deck and tagged dawn, Jacksonville Fl, travel. Bookmark the permalink. What inspired you to be up so early? Jogging? Or still up from the night before?